Purchasing a hosting plan is not exactly a difficult step, however, if you have decided to purchase a Bluehost hosting plan, then here is Bluehost WordPress Installation Guide you may refer to. Just follow the below-mentioned instructions and you’ll be able to buy a hosting plan from Bluehost within 10 minutes. But, before we go further, it is imperative for businesses and individuals like celebrities and public figures to determine the type of content that they are about to post. Based on that, they need to select a plan that suits their need. Step 1 : Visit Bluehost by clicking HERE. This will take you to the below-mentioned welcome page of the company, where you are advised to read the terms and conditions before proceeding to the next step. 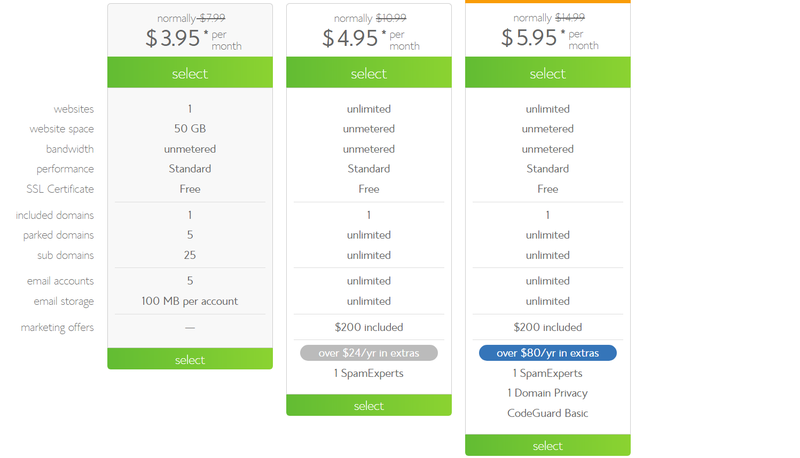 Step 2: Select a hosting plan that suits your need. Choosing the right plan will be easier for you without putting the low price into consideration since you now know the value you intend to get from the website. For those still contemplating on which plan to choose, it all depends on the features you want. I recommend that you go with the business plan, also known as the electric blue plan since it gives you the opportunity to use three domains or you can go with the Pro plan, also known as the true blue plan if you want to host more than 3 domains. 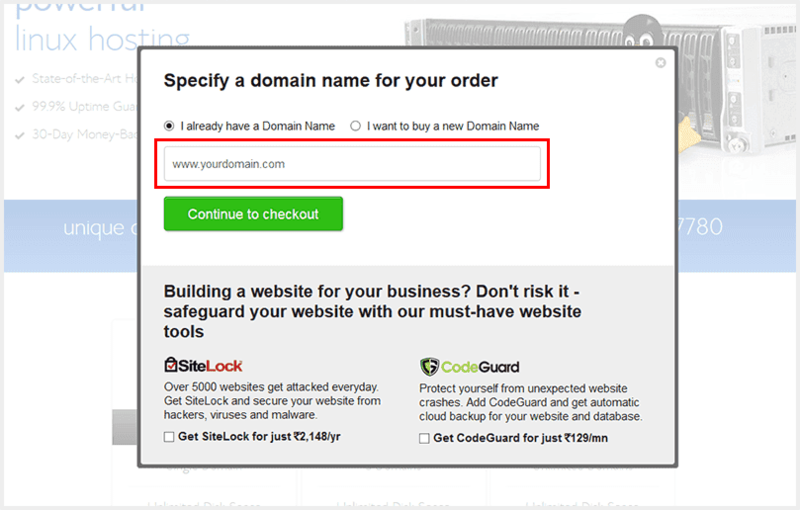 Step 3 : After choosing the hosting plan, the next step is to choose if you have a pre-registered domain or not. If you have one, you will be required to enter the domain name before proceeding or buy a new one in case you don’t have a registered domain name you want to link to it. Buying a new one doesn’t cost much but few rupees. Further, you can get one at a discounted rate through the use of Bluehost Domain coupons. Also, before clicking on the “continue to checkout box”, it is advisable to mark/unmark the box labelled with green and red. 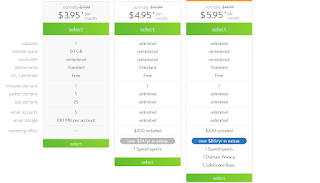 These are added services that will incur extra cost in your hosting plan. However, they are essential as SiteLock will protect your site in the event of a cyber-attack threat and CodeGuard will automatically save your code in case of site crash. Check/uncheck based on your need. Step 4: The next stage is the order summary page, which will require you to choose the number of years that you want to host under Bluehost. It is advisable to choose two or more years to save the cost of offering the service since you’ll be given discounts for services more than a year. Step 5 : The next stage is the “sign in” into your account page, which can be done if you have already opened an account with Bluehost before the period of undertaking the process. If you don’t have an account, then you can click on “create an account” which is free and easy to create. Step 6: After logging into your account or signing up, the next stage is to make the required payment using the method that pleases you. Payment can be made either by credit card, debit card, direct bank deposit among others. Note : Any information provided will be safeguarded from theft and third party.After these steps, you are ready to go on with creating your dream website. The sky blue (also known as Standard) plan that goes for Rs.309 per month. The electric blue (also called business) blue that can be purchased at Rs.349 per month. The true blue (also known as Pro) which can be purchased at Rs. 449 per month. 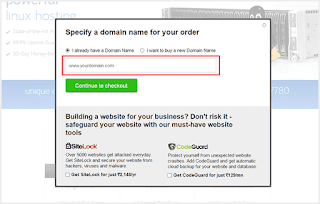 Domain Name Feature: Attaching a preferred domain name to a hosting account is all you can benefit from some of the domain hosting companies. However, that is not the case with Bluehost. 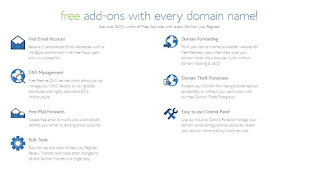 Two personalized email addresses like yourname@yourdomain.com that is spam free and virus protected. Free Lifetime DNS management service with a high redundant infrastructure. Free Domain Forwarding, URL Masking and Path Forwarding. 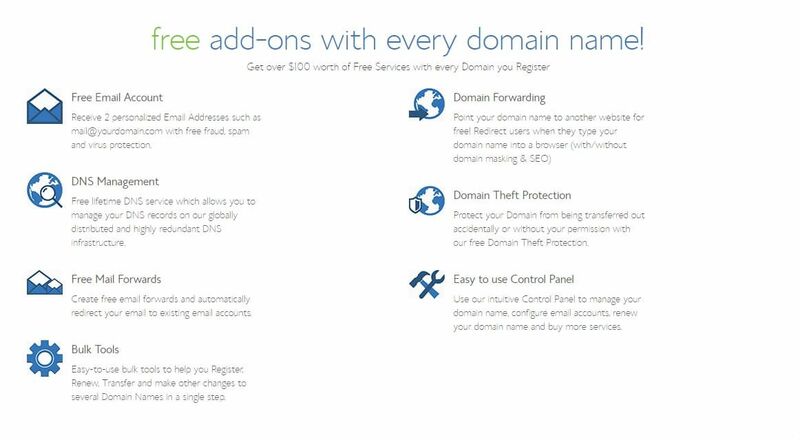 Free Protection from Domain Theft. Bulk tools available that help you to transfer, renew or register domain names and make changes easily. 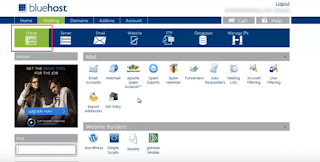 Powerful Hosting Control Panel: Full access to the control panel is also an important feature awaiting the user after purchasing the plan. Monitor Server Status around the clock. 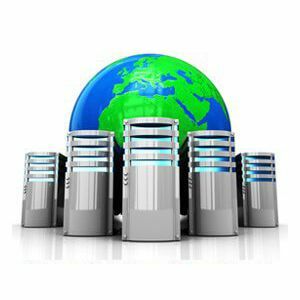 Create Hosting Packages – Bandwidth, Limit Disk Space, Databases, Email, etc. Support for POP3, SMTP, and IMAP. Blackberry, Android, and iPhone support. Easy to use Webmail Interface. Thunderbird, Outlook, and Windows Mail compatible. 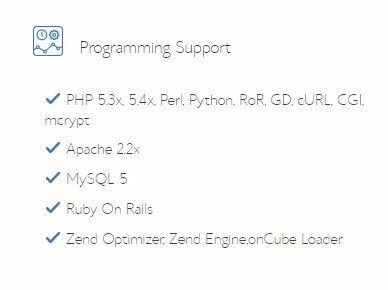 Programming Support: The hosting plan gives the opportunity to write scripts with different languages for diversification and easy assessing. It accepts PHP of different versions, Python, Perl and other languages used in coding. It also supports my SQL, Zend engine, and installation of various management systems like Blogger, WordPress, etc. Add-ons can also be installed within seconds making the site better in design. ionCube Loader, Zend Engine, Zend Optimizer. Python, Perl, PHP 5.3, PHP 5.4, GD. CGI, cURL, MySQL 5, mcrypt. Reliable Server: The server can be trusted throughout the year thanks to the strength and complexity of their Server hardware. It has a battery backup and RAID controller, which helps to conquer the redundant power supply that might be encountered. Bluehost server is built on a 2.40GHz quad-core which makes the server faster and a 24GB RAM drive that makes their hosting services the best. 1 Terra Byte RAID 1customer data drive cached. Xeon Hyperthreaded quad-core processors powered by Dual 2.40GHz E5530. Redundant Power, HVAC & Fire-Detection Systems. A 250 GB of RAID 1 OS drive (mirrored). Battery backed RAID controller for all drives. E-commerce optimization: One of the reasons businesses and organizations choose Bluehost for their hosting service is because of its e-commerce support feature. 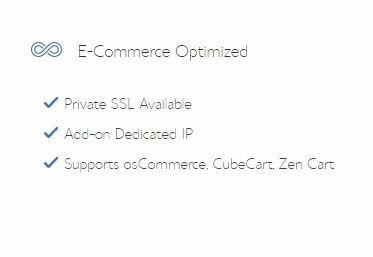 The hosting service supports most of the internet commerce platforms and makes it effective with its high-grade security that is used to secure the trader’s data and information. Email Features: Considering the fact that customized email is a very important feature when making business dealings on the internet, Bluehost gives the opportunity to email customizing to the form that will suit its usage. 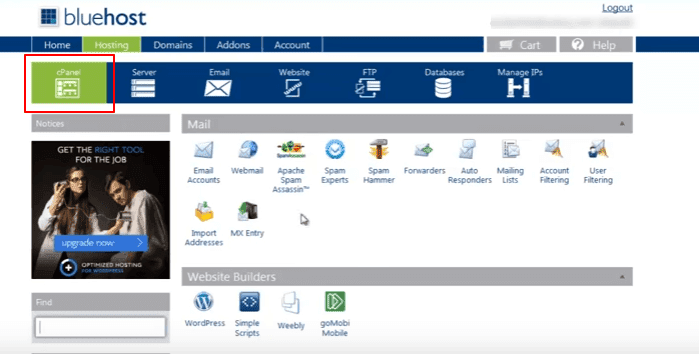 Bluehost webmail interface is also easy to use and can be accessed from smartphones like Android, iPhone and BlackBerry devices. It also has an advanced anti-spam protection that will help to reduce spam emails.